The 2017 Oscars had everything: delightful moments, predictable wins, notable firsts, and, as the viewing audience saw play out on live television, one major surprise milestone. La La Land — the most nominated film of the evening and the Best Picture frontrunner — not only suffered a major upset by losing Best Picture to Moonlight, but its producers experienced a whirlwind rush of emotions live onstage as the film was mistakenly announced as the winner. And in the process, it set not one but two instantly notorious records for itself. But many other Oscar wins were significant in other ways — like a 21-time nominee finally taking home his first statuette, and a record number of wins going to black nominees. Here’s a look at all the notable milestones from the 2017 Oscars. If the chaos of the Best Picture announcement seemed momentous, that’s because it was. Previous Oscar ceremonies have aroused suspicions that the wrong name was read onstage, but there’s no evidence to suggest it’s ever actually happened before. Not only did La La Land miss out on the Best Picture win, it also missed its chance to set an all-time Oscar record. If it had won at least 12 of the awards it was nominated for, it would have beaten the three current record holders, which each won 11 Oscars in their respective years: Ben-Hur (1959), Titanic (1997), and The Lord of the Rings: Return of the King (2003). Even more shocking: La La Land’s failure to win Best Picture made it the first film in history to earn 14 nominations but lose Best Picture. Both of the previous two films with 14 nominations, All About Eve (1950) and Titanic (1997), ultimately took home the big prize. Surprising as it may seem, the 2017 Oscars mark the first time in the awards’ 89-year history that more than three black winners took home a trophy. As Bustle points out, “while there have been dozens of black nominees in the Oscars’ nearly 90-year history, no more than three have ever been awarded in the same year.” Not so in 2017, when multiple black creatives took home trophies. Those winners include Moonlight’s Mahershala Ali for Best Supporting Actor; Fences’ Viola Davis for Best Supporting Actress; O.J. : Made in America director-producer Ezra Edelman for Best Documentary Feature; and Moonlight’s Barry Jenkins and Tarell Alvin McCraney for Best Adapted Screenplay. And Moonlight taking Best Picture was, of course, a huge win for its all-black ensemble and diverse creative team. Chazelle is 32 years old, making him the youngest directing winner in the awards’ history. The previous record holder, Norman Taurog, won the award in 1930 for his comedy Skippy and held it for an impressive 86 years. Taurog was also 32 when he won his statuette, but still older than Chazelle by months. Moonlight’s chances in the Best Actor category were a little complicated this year because its three leads each played the same character, at different points in the character’s life. But in the Supporting Actor category, Mahershala Ali was the clear favorite to win. And win he did, becoming the first Muslim actor in history to do so. It takes a weighty documentary to cover a weighty subject such as the O.J. Simpson trial, andO.J. : Made in America’s decision to stage a theatrical run in order to be eligible for the Oscars paid off. Not only did the ESPN-produced project take home the prize for Best Documentary Feature, it became the longest work in history to win an Oscar, with a run time of seven hours and 47 minutes. Prior to O.J.’s win, the record holder was War and Peace, which won in 1969 and which clocks in at seven hours and 12 minutes. O’Connell has been nominated 21 times in his four-decade career, for films like Top Gun andTwister. But he’s never actually won until now — for his work on Hacksaw Ridge. When accepting his hard-won trophy, he delivered a touching, classy speech in which he thanked his mom for telling him to work hard and win an Oscar. Despite earning consistently positive reviews, none of the seven films in the original Harry Potter film franchise were ever honored by the Academy — not even under director David Yates’s steady helming of the second half of the franchise to date. That changed this year when spinoff Fantastic Beasts and Where to Find Them nabbed a win for Best Costume Design. Accio Oscar! 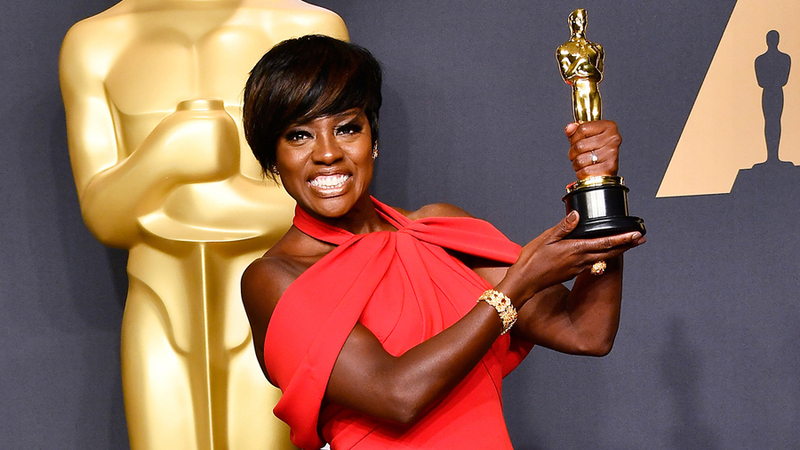 When Davis won the Best Supporting Actress award for her role in Fences, she became the first black woman who’s won a Tony, an Emmy, and an Oscar. She had previously won two Tonys, one in 2001 for Hedley II and one in 2010 for her performance in Fences on Broadway. She won the Best Lead Actress Emmy in 2015 for her role on ABC’s How to Get Away With Murder. Not only was Moonlight a huge win for the black community, it was a major triumph for queer narratives in Hollywood. Shortly after Moonlight’s win, GLAAD tweeted that it was the first film in history with a queer main storyline to win the Oscars’ most prestigious award. Netflix nabbed its first Oscar win, in the Best Documentary Short category, for The White Helmets, while Amazon picked up wins in two major categories: The Iranian film TheSalesman won for Best Foreign Film, and Manchester by the Sea won Best Original Screenplay. Both The White Helmets and The Salesman became sources of political tension prior to the ceremony due to President Donald Trump’s controversial travel ban, as both films involved creatives and/or subjects from the affected majority-Muslim countries, including The Salesman’s director, Asghar Farhadi. Amazon’s two wins also marked the first time a streaming service has snagged an Oscar for a feature-length film. Oscars host Jimmy Kimmel scored a social media victory with his snarky “u up?” tweet to President Donald Trump, sent as he stood onstage during the ceremony. By the time the ceremony ended, the tweet had been retweeted more than 200,000 times and liked by more than 400,000 accounts. As of press time, Trump had yet to reply.